While much of this information is also copied elsewhere, we thought it might be useful to show how this module was built step by step. 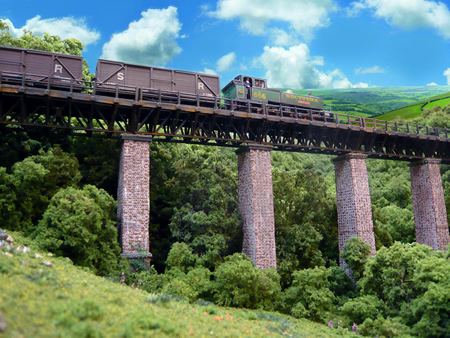 We have spent a great deal of time discussing the design of the viaduct as it is such an important element of the County Gate layout. 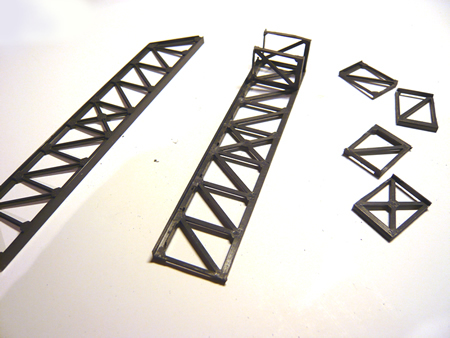 Finally, we decided that we did not want to have a 'Chelfham structure' as this had been modelled so often already. 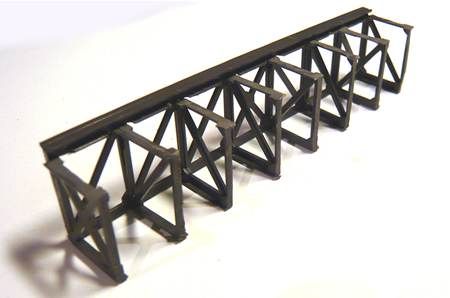 The open structure of the lattice girders will allow the trains to be much better seen and the girder lattice has very good visual impact. We want the trains to 'teeter' across it! 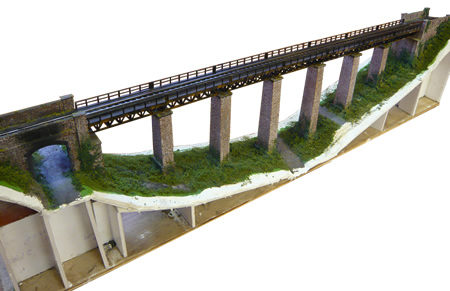 A deceleration circuit will be put in place on the viaduct. I am fortunate in having a civil engineer son who did rough calculations to confirm that the full sized structure would be safe and an appropriate design of the period for the prototype loads. 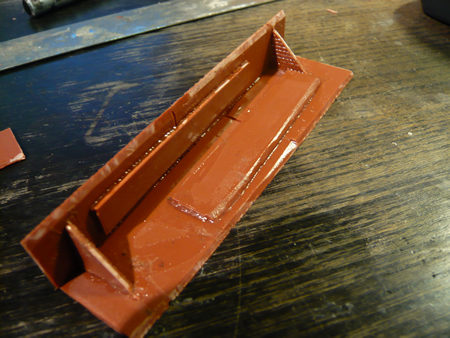 The plastic building sheets produced by Wills are a fantastic aid to scratch building. Some special techniques are needed to make sure the resource is best used. The material is slippery and it is very hard to hold a steel rule in place while cutting. 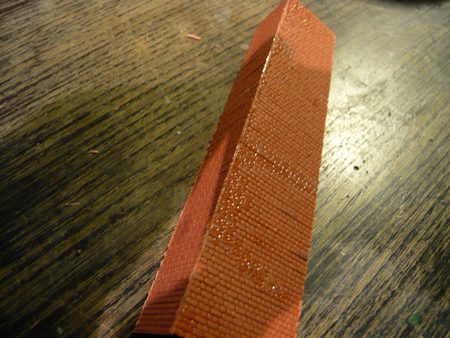 We use a steel rule that has has fine sandpaper glued to one side. This stops those embarrassing errors with the knife. It is important to use sharp cutting blades. They become blunt quite quickly when hacking at this hard material. As the point loses the edge, we break off the tip to expose a new cutting edge. When cutting a sheet, two passes of the blade is usually sufficient to score the plastic enough to be then able to snap off the part by bending. 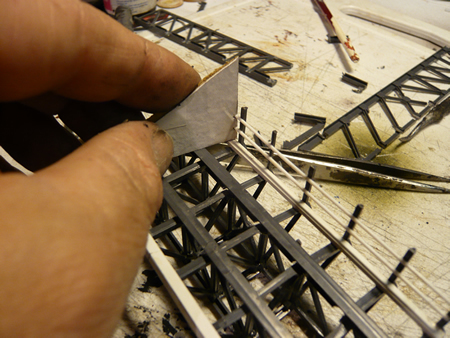 When making the viaduct, we had many surfaces to cut which were at an angle. 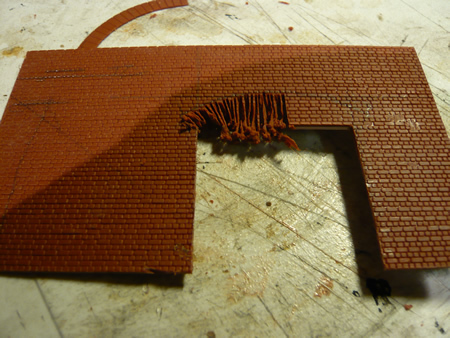 We used one sheet of plastic as a pattern, and cramped it on to the sheet to be cut to prevent any slippage. When mitring we just hack with the knife until a good angle is obtained. We always undercut slightly so that the contact point is at the surface. We also undercut joints slightly on but joins to prevent any cracks showing on the face side. 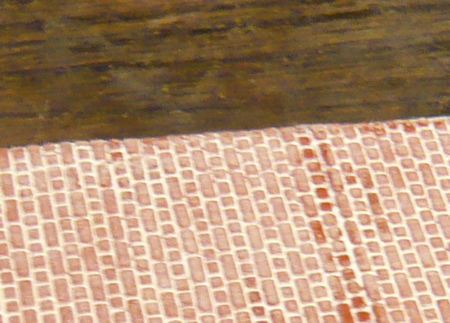 the but joints are reinforced using off cuts. While the glue is still slightly soft, make sure that the face surfaces are accurately in line. 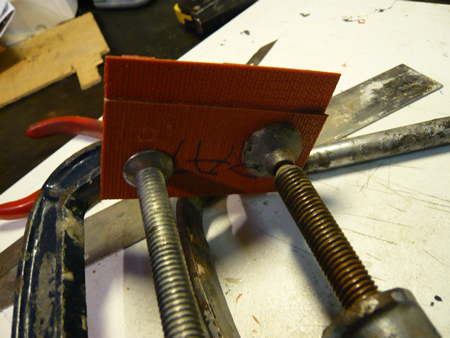 When gluing, coat both mating surfaces a couple of times, then run more Plastic Weld into the joint from behind. It is important that glue does not migrate to the face as detail will be lost. After a few minutes, the plastic is sufficiently soft to be able to gently 'wiggle' both surfaces together so that any irregularities are filled by molten plastic. Make sure that brick courses, etc., are in line. We often add triangular bracing pieces to strengthen the joint. When the joint has fused, but is still very slightly soft, we run a sharp blade across the corner to remove any excess plastic. The brick joints are then extended round the corner using a lightly applied blade which is rocked side to side to expand the joint to the correct width. Observe with care bricklaying techniques used on the prototype. 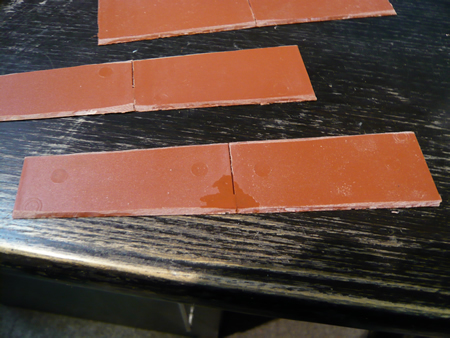 Fancy brick courses can easily be cut from the sheet. 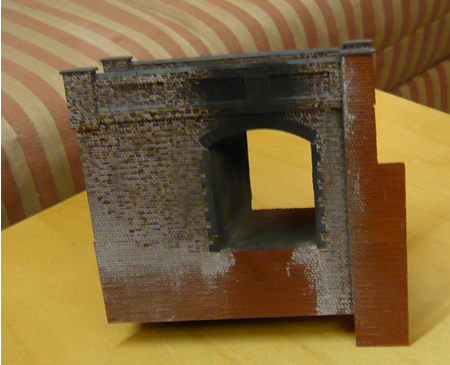 If you wish to have curved bricks, the profile can be sanded and the brick courses added with the craft knife. We prefer to build Wills arches flush into the sheet. This means accurately cutting the sheet. For this we use a Dremel cutting disc. The final fit is done with careful paring with a knife. 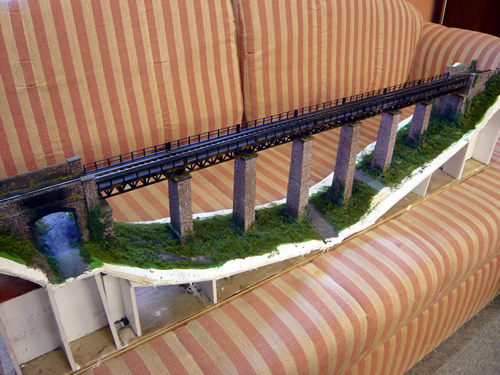 The bridge for the harbour branch under the South abutment. We use acrylic paint. For brickwork, we first paint overall white and immediately wipe it off to leave the joints white. 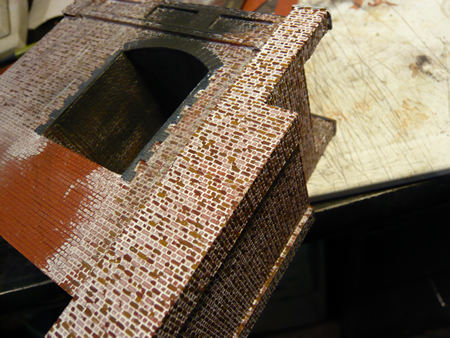 Brickwork picked out with three colours. 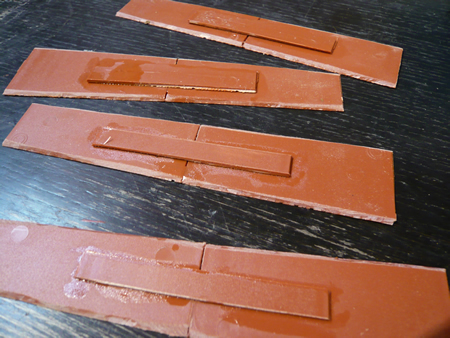 Bricks are then picked out in a mixture of colours which must reflect the bricks used in the structure. We then treat with weathering powder and add streaks, etc with a dry brush technique. 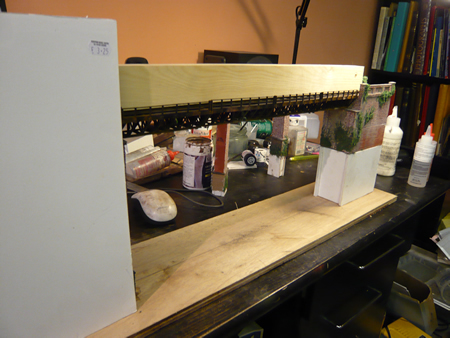 Once the truss is fabricated, the foot walk canter levers are cut from spare trusses. 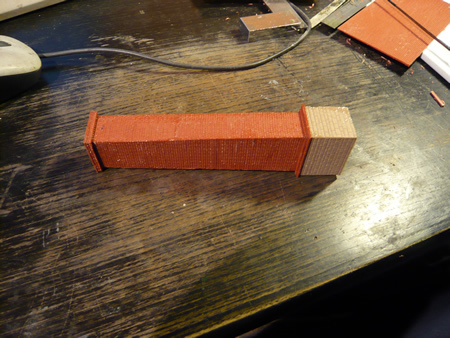 Each end is first fitted and joined with the 'timber balk' and the others are fitted afterwards. Care is need to ensure all is square. 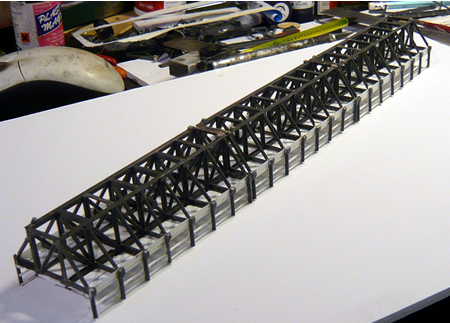 Handrail stanchions are also made from parts of the spare trusses and the rails attached using the jig shown above. 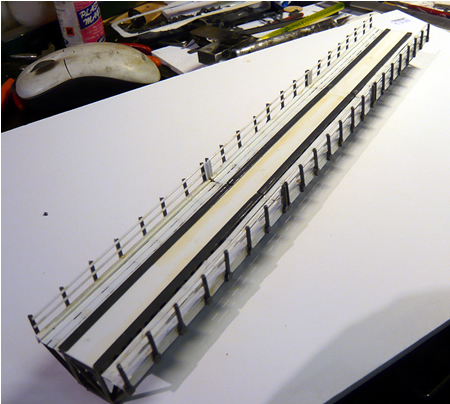 All the spans can be glued together making sure they are straight and in line. 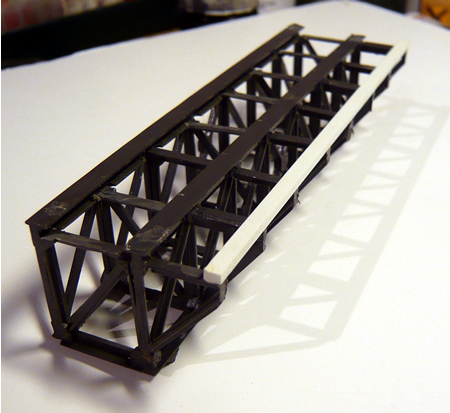 The viaduct is assembled on the plywood base. Care must be taken to ensure the piers remain on centreline and are vertical.